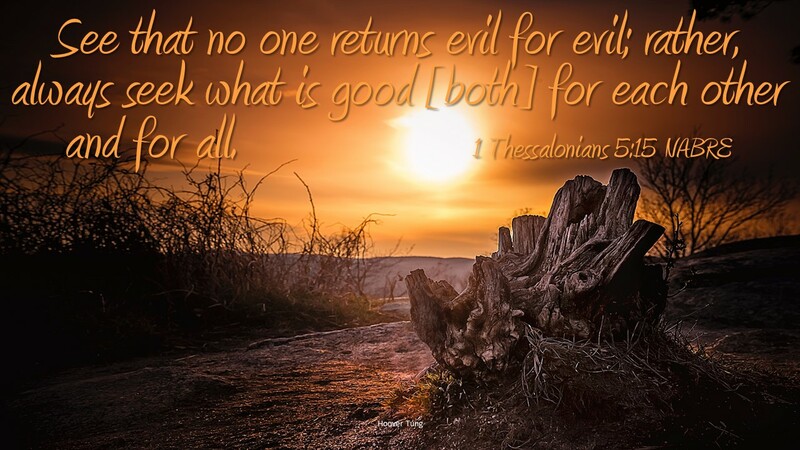 In the section with the quoted verse of the first letter to the community in Thessalonica, Paul is exhorting them to care for one another. He encourages them to support and love their Pastor. He has the care for all others completely, his ministry is love, leading people to Christ and the salvation of souls. People in the community should lift each other up. If you see a defect in a brother or sister it is good to call their attention to it and help them overcome this defect through correction. Which also means that community members should accept correction, it is not anything anyone should resent, but seen as something very good and beneficial, it leads to conforming to the will of God. Paul turns in the quoted verse to the teaching of Christ. The Mosaic Law, which was the rule of the day said if your neighbor took your eye you were entitled to take their eye as well. Jesus wants to overtake the law with charity. Jesus says if your neighbor slaps your cheek, turn and offer him the other cheek. When someone does wrong it is never overcome or corrected by doing wrong in return. We can’t overcome evil with evil, but overcome evil with good. (cf. Romans 12:21) A forgiving attitude serves to bring bad actors closer to God. By forgiving and not getting even, loving the wrong doer and acting out of kindness they will see us imitate God, they will see God. When we seek what is good, we are being an example of a true Christian, one who acts like Christ. When people think of Christians today I am not sure they see this forgiveness readily. But, Jesus came for forgiveness and we should be living examples of forgiveness in the world for Christ. Do you seek to get even? Has getting even helped?